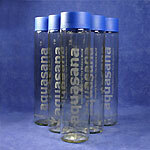 Aquasana is Latin for "water to heal" and their products were designed with this concept in mind. Years of research and development went into the results that Aquasana products offer. By providing the best-tasting, healthiest water at an affordable price and with the ultimate in convenience, Aquasana products represent true value and purpose. Aquasana is the #1 rated home water filtration system in America and was voted "Best Buy" by Consumers Digest magazine for the years 2003, 2004, 2005, 2006 and 2007. The Water Key highly recommends Aquasana Filtration Systems to anyone who is looking for the best product value at the best price. NO OTHER PRODUCT OFFERS MORE DOCUMENTATION OF QUALITY! Aquasana's exclusive dual filter system uses a combination of carbon filtration, ion exchange and sub micron filtration to produce truly healthy, great-tasting water conveniently from your kitchen tap. 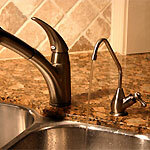 Filters out chlorine, lead, VOCs, MTBE and cysts (chlorine-resistant parasites) and leaves in the natural trace minerals! Aquasana's exclusive dual filter system uses a combination of carbon filtration, ion exchange and sub micron filtration to produce truly healthy, great-tasting water conveniently from your kitchen tap. 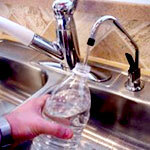 Filters out chlorine, lead, VOCs, MTBE and cysts (chlorine-resistant parasites) and leaves in the natural trace minerals! Includes the Complete Kitchen Filtration System with two filter cartridges, plus the Deluxe Under Counter installation kit. Aquasana's exclusive dual filter system uses a combination of carbon filtration, ion exchange and sub micron filtration to produce truly healthy, great-tasting water conveniently from your kitchen tap. Filters out chlorine, lead, VOCs, MTBE and cysts (chlorine-resistant parasites) and leaves in the natural trace minerals! 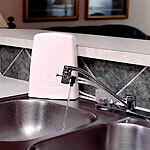 Includes the complete kitchen filtration system with two filter cartridges, plus the Basic Under Counter installation kit. 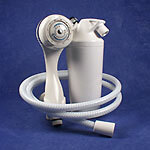 The Aquasana Shower Filter has a unique two-stage filter process that takes out chlorine and balances the pH in Stage 1 and filters out harmful VOCs and THMs in stage 2. The result is the healthiest, most refreshing shower experience you'll ever have ... for only 23¢ a day! 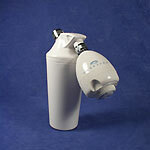 The AQ-4100 Aquasana Shower Filter guarantees softer skin and hair in 1 week or less! It's just like showering in natural spring water! Enjoy the convenience of an adjustable hand-held shower head with the same filtration capabilities of the standard Aquasana Shower Filter!